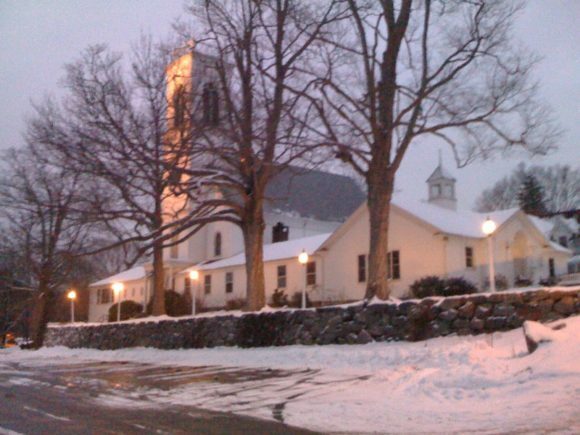 Advent in Essex celebrations take place at the churches in the Essex Villages, including The First Congregational Church in Essex, UCC. ESSEX — The churches of the Essex Villages have jointly coordinated some special celebrations throughout the Advent season (Nov. 27 – Dec. 18) at their respective houses of worship. Every Tuesday in Advent, a Potluck Dinner and Compline (Night Prayers) will take place at Trinity Lutheran Church in Centerbrook at 6:15 p.m. Bring a dish and come for a time of conversation, followed by a prayer service at 7 p.m.
On Dec. 18, at 3:30 p.m., The First Congregational Church in Essex, UCC hosts a “Blue Christmas Community Service” of grieving, praying and healing for all who are missing loved ones during the holiday season. All programs are free, with the exception of the Christmas Soiree. For more information, visit www.adventinessex.org.